Juliette Cream & Pine Living Room Furniture -Tables Storage Cabinets Chairs. 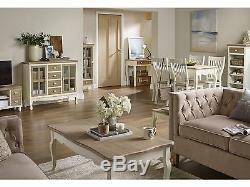 Juliette Cream & Pine Living Room Furniture -Tables Storage Cabinets Chairs Description. Compose the perfect vintage shabby chic look with our Juliette range. With lots of pieces to mix and match from youll be able to create your own personalised interior in no time. Furthermore, most pieces come pre-assembled for your ease. The Juliette range is 100% hand finished and although great care is taken to ensure the quality is just what you are looking for... Its distinctive design lends itself to what looks like imperfections, but these are simply just part of the furnitures charm and characteristic of the shabby chic look. Juliette Sideboard W1000mm x D400mm x H875mm Fully Assembled. Juliette Wine Rack/Storage Unit W470mm x D310mm x H1195mm Fully Assembled. Juliette Plant /Lamp Stand (set of two) W300mm x D300mm x H760mm W235mm x D235mm x H620mm Fully Assembled. Juliette Display Unit W480mm x D320mm x H1210mm Fully Assembled. Juliette Console table with Drawers W800mm x D400mm x H750mm. Juliette TV /Media Unit W900m x D400m x H450mm Fully Assembled. Juliette Coffee Table W1090mm x D640mm x H450mm Fully Assembled. Juliette Lamp Table W400mm x D305mm x H: 460mm Fully Assembled. Juliette Nest of 3 Tables W300mm x D240mm x H290mm Fully Assembled. Your order will be delivered by courier. If the item is flatpacked we can usually replace the damaged parts without the need for a return. If the original packaging isn't available then suitable packaging must be used. Due to health protection / hygienic reasons, unsealed mattresses are not eligible for return. Please read our feedback, our customer service is exceptional and no customer ever gets left stranded. For example if you order on a Monday we expect to deliver on the Wednesday. For orders received on a Thursday we will aim to deliver on the Monday. For orders received on a Friday or on a Weekend we will aim to deliver on the following Tuesday. The courier will call you the same day to arrange a suitable day and time to deliver to your premises. The item "Juliette Cream & Pine Living Room Furniture -Tables Storage Cabinets Chairs" is in sale since Tuesday, October 11, 2016. This item is in the category "Home, Furniture & DIY\Furniture\Tables\Coffee Tables". The seller is "panoplyfurnishings" and is located in Preston. This item can be shipped to United Kingdom.